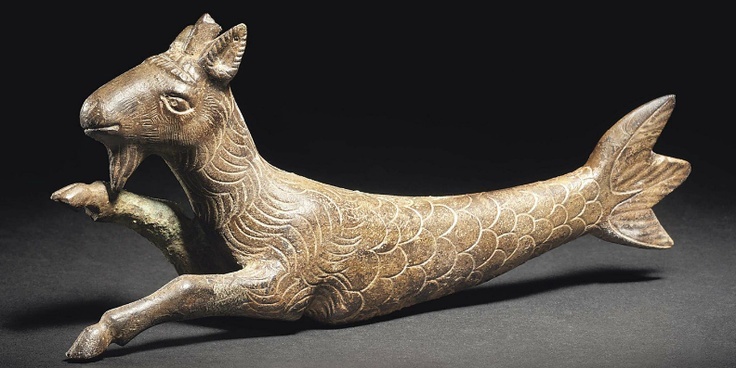 This is some kind of metal sculpture of a fish body and a goad head, however this goat has no horns. The detail is intrinsic in the lines in the body and the fish scales, and on the tail. It looks fairly simply made with a smooth surface, except where the texture comes out in the lines and on the ears and around the eye on the face. One front leg is raised like it is trying to run or kick something, but it looks playful. Also, the shape of the tail implies movement, like it is swimming, or in action of some kind.